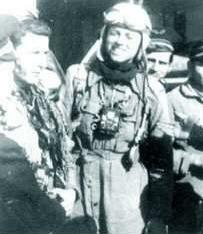 Gabriel Gauthier, french fighter pilot. Among the strong personalities known in the French Air Force, Gabriel Gauthier incontestably imposed his stature which was out of the ordinary. Born in Lyon in September 12th 1916, he entered the Air Force Academy in Versailles in 1936. He was assigned to fighter group GC (Groupe de Chasse) II/7 in October 1938 where he remained for over six years. Gabriel Gauthier was in combat since the first day of the war, but on the 21st of December 1939, he was seriously wounded. Half paralyzed, he managed to make an off field landing, and from his hospital he continued to follow the outcome of the French campaign. He successfully rejoined North Africa, where GC II/7 had taken refuge. The sojourn in Tunisia, between June 1940 and November 1942 was rather calm. Then, things happened again with the Allied landing in November 1942. GC II/7 was the first group re-equipped with Spitfire and he saw action in the last days of the Tunisian campaign at the end of April 1943. On August 2nd 1943, Gabriel Gauthier became Commandant of the 4th Escadrille. 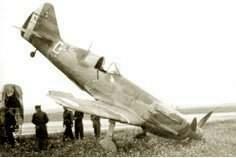 On September 15th 1944, he was once again shot-down and wounded, by Flak this time, between Montbéliard and Belfort. Thanks to the resistance, he managed to breakaway and reached Switzerland, from where he calmly continued his escape in December. He rejoined his group, and took its command on February 24th 1945. The hostilities had barely ended when Gabriel Gauthier was sent to the United States to take a course at the famed Command and Staff School. Returning in the spring of 1946, he was summoned to General Bouscat's high command. At the end of the year he was promoted to Major. A few months later, he became second in command of the 6th wing in Rabat, then in 1948 he became Commandant of the base in Meknes. Two years later, he returned to France to take command of the 2nd wing in Dijon. He was the main driving force for the revival of the Patrouille de France. In the mean time, promoted to Lieutenant Colonel, he was sent to Indochina for a short stay (May 1954) and in 1956, he became chief of aerial defense. Promoted to Colonel in May of the same year, he took command of the 3rd wing in Reims. With the 3rd wing, he participated in the Suez "affair", from the chypriote d'Akroti base. But, since this base was void of material and everything else, Gabriel Gauthier decided to transfer the entire necessary supplies that could be found in Reims. A journalist learned of this story and qualified Gabriel Gauthier as « The big mover of the century ». His D-520 on its nose, Sidi-Ahmed (Tunisia), mid-1942. Tradition was that the individual numbers be replaced by a letter, the initial of each pilot. Since he arrived after Second-Lieutenant Michel Gruyelle, Gabriel Gauthier added the initial of his first name. Those two letters would become famous in the French Air Force as his nickname. Stuttgart (D), 8th May 1945.